Getting there: Big M is between Manistee & Wellston in Manistee County, Michigan. From Manistee take M55 14 miles to Udell Hills Road, take that road south 3 1/2 miles to the Big M.
From the east, take M55 west 29 miles from Cadillac (12 miles from M37) to Udell Hills Road. 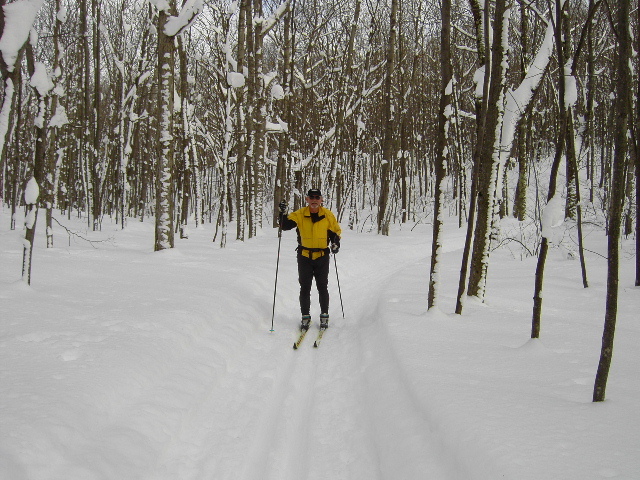 What's there: We are a premier cross country ski area in the heart of the Manistee National Forest near Wellston MI. Our trails are classic trails that are narrow and wind through the mature hardwoods and pines of the Manistee National Forest. The trails offer a variety of terrain to challenge every biking and skiing experience level. The hills receive an average of 130 inches of snow from December through March, providing excellent cross country ski conditions. We have a Ginzu groomer, funded with your contributions. It can grind up icy snow and re-lay it (providing there is enough base snow).